There are still a surprisingly large number of part-exchanges at auction, possibly as dealers clear the decks for the 08 influx. £180 bought three: an 86D Golf 1.6CL auto, a 90H Audi 90 and an 89F FIAT Uno 45. While an extra £85 took away a 95N Citroen ZX 1.4 in the ‘no reserve’ section. But as always when the public arrive in numbers there were variations in the bidding. 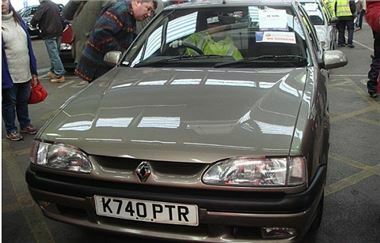 Two 93K Renault 19 1.4s came up in different sections in similar condition, one 83k miles, the other 90k. The shiny one in the photo went for £230; the other for £150. Only £80 difference to you and me, but in percentage terms the dearer car was 53% more expensive. And someone went stark, staring mad over an 86k mile 7 year old Previa D-4D, paying a crazy £6,200 to drive it home. The fleets seemed to be easing back on reserves. First time I’ve seen a current shape SLK under £20k, and this one was a 350 that went for £18,400. Barcelona box, though (Manuel). But buy of the day had to be a 2004/54 Mercedes C180 Classic estate, again ‘Lever Espana’, and 98k miles, but for £5,950? They’re going to have to find a new status symbol in Southall. Prime Fleet, Leaseplan live online, Sytner p/x, Lex, CarGiant, Jardine p/x, Renault Financial Services, Black Horse, Inchcape p/x, Snows Group p/x, Trident Honda p/x. Light Commercials from Leaseplan, XBG, Citroen, Fleet Direct, Northgate. Fleet & Finance, LTSB Autolease, Motability, Lex, Charters p/x, British Telecom Fleet, Peugeot Motor Co, Masterlease, Hitachi Capital, General Section, Inchcape p/x, Private Sure Sell. Fleet Direct, Lex, Porsche Retail p/x, Mercedes Benz Retail p/x, Top Car, Franchised Dealer p/x, Inchcape no reserve p/x, Ridgeway VW p/x, Hartwells p/x, Pendragon p/x. Prime Fleet, Hitachi Finance, Leaseplan live online, Black Horse, Lex, Jardine p/x, Renault Financial Services, Inchcape p/x, Snows Group p/x, Sytner p/x, Trident Honda p/x. Fleet & Finance, LTSB Autolease, Motability, British Telecom Fleet live on line, Lex, Vauxhall Leasing, Masterlease, Hitachi Capital, General Section, Inchcape p/x, Charters p/x, Private Sure Sell. Fleet Direct, Lex, Porsche p/x, Mercedes Benz Retail p/x, Franchised Dealer p/x, Inchcape no reserve p/x, Ridgeway VW p/x, Hartwells p/x, Pendragon p/x. Fleet & Finance, LTSB Autolease, Motability, Lex, Charters p/x, British Telecom Fleet live online, Masterlease, Hitachi Capital, Peugeot Motor Co., General Section, Inchcape p/x, Private Sure Sell. Volvo, Prime Fleet, Hitachi Finance, Leaseplan, Black Horse, Lex, Jardine p/x, Inchcape p/x, Snows Group p/x, Sytner p/x, Trident Honda p/x. Fleet & Finance, LTSB Autolease, Motability, Charters p/x, British Telecom Fleet live online, Vauxhall Leasing, Masterlease, Hitachi Capital live online, General Section, Inchcape p/x, Private Sure Sell.